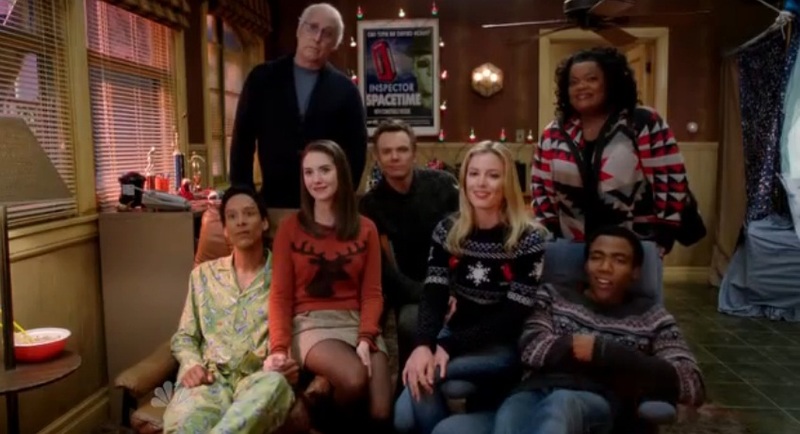 Thursday’s “Regional Holiday Music” may have been the last episode of Community. If 30-Rock has taught me anything about television, it’s that the phrase “extended hiatus” is network executive code for cancelled. If that’s the case, then Community went down swinging. If not, then in the months to come it will rise from its own ashes having thoroughly bitten its thumb at television and television audiences. Here’s why. Abed and Troy’s Rap: The significant portion comes in the concluding lines, “We have to be happy to get to the end; we have to save Christmas to save our friends.” There’s not a lot of subtlety built into that refrain. By Abed’s own admission at the start of the episode, the season has been dark. Of course dark times at Greendale equals comedic gold for the audience. But oh no, dark isn’t what people want from their comedy. They want a laugh track that fires off every 3.14 seconds as Whitney breaks the balls of her beta delta epsilon male boyfriend. From there the second part is pretty easy to decode; save the ratings at Christmas to save the show. It’s about as close as a series can get to asking the audience to watch without committing a fourth wall violation. 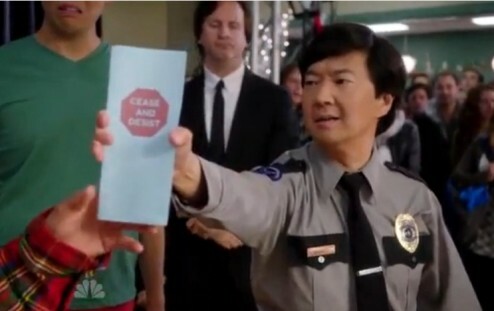 Pop Culture: With Abed on a quest to bring his friends together for the holidays, the audience finally gets to figure out the pop culture references on their own. The setup to this nod to the 1978 remake of Invasion of the Body Snatchers is possibly the best lead-in that anybody could have imagined. It’s easy to dismiss the sci-fi flavoured gag as a throwaway bit, especially in the wake of Pierce using religion against Shirley. But let’s take a moment to think about the reference. Body Snatchers was about conformity, group think, and the death of individualism. Sounds a lot like what happens within a choir. Individuals, along with their vocal flaws, cease to exist within the lyrical Borg Collective that is group singing. Sure it’s easy and inclusive, like singing/reality/dancing television, but it’s also ephemeral and transitory. Doctor Who: This one has me stumped. Why is Community protecting/masking Doctor Who? The show has never had a problem with squaring itself against other pop culture. When Jeff began editing the Greendale newspaper Abed took to calling him Hawkeye. Abed even went so far as to build Jeff a Gin mill in his office. Yet for some reason Doctor Who is wrapped in its Inspector Spacetime cloak of pseudo anonymity. And why was the long lost Inspector Spacetime Christmas special critically reviled? The recent Doctor Who Christmas specials have become a fixture of the holiday season in the UK (and my house). That said the horrors of Inspector Spacetime’s “Timeday” episode did bring the group together. The final line: We’ll see you all after regionals. Should those words give us hope? Or has Community literally sung its swan song. I honestly don’t know. Smart shows die young. It’s a fact of television. All that is certain is that Community did not go quietly into the night. But that is why this show is doomed on NBC. The density of pop culture, meta, sci-fi is too much for a laugh-track culture. It’s a truism that most people read to escape, not be challenged. This is true ten-fold on TV. Not to mention the cast and creators’ evident frustration. Catch The Soup last night? Almost the entire cast was on with Joel McHale, roasting NBC. They claimed the show was a figment of Joel’s imagination. If Community was real, Alison Brie asked, then why aren’t there commercials for it on NBC? I wonder if Dan Harmon and company rubbed someone the wrong way, so Community was put up against the juggernaut of Big Bang Theory to slowly kill it. But I said doomed on NBC. I have to believe a cable network out there is eyeing the critical acclaim and fan reactions and would be willing to pick up this show. I did have a bit on Jacob’s dance but I ended up cutting it as it was just more snark of the “This is the reality of reality/dance/musical television that people are somehow blind to” variety. Seemed like flogging a dead horse. BTW: Slate ran a piece on the episode that suggested the Inspector Spacetime bit was in fact a send-up of George Lucas’ god-awful Star Wars Christmas special. I still want a reason for all the cloak and dagger with Doctor Who. Perhaps somebody at NBC told Dan Harmon that he’s just not allowed to piss off the BBC with actual satire.